There are bigger and crazier sport fans than I am, but I would still weigh in on the “serious supporter” side of sports enthusiasts, and the recent NBA talk around the city has really peaked my interest. First, I want to be transparent upfront: since I returned to the city seven years ago, I’ve dreamed of a NBA team in my favorite city almost daily, and I push every chance I get to win over dinner party friends when the conversation heads that way. I would actually invest my “first communion” money in this dream if I thought it would help secure a franchise just to position Louisville and the Commonwealth as the potential “Basketball Capital of the World.” This would be the first thing I would brand out if I were Mayor or Governor. We are a city and state on the verge of breaking out especially when considering the news this week that we are a “top 10er” for best U.S. cities for jobs! The NBA if nothing else is a magnet for talent recruitment, an economic driver to enhance our growing workforce needs which will make the difference for more global industry relocation in our state—a “common” “wealth” goal for our city and state leaders! Second, I am throwing my personal support as a community leader to help organize grassroots efforts, along with others, to bring professional basketball back to where its deepest roots were seeded decades ago by Kentucky pioneers, way before the NBA ever thought about becoming one of the most recognized brands in our first “Dream Team” World Tour in 1992! Like you, I watch and listen, and I do understand the growing appeal of soccer around the world, and have been to many games locally myself. But it seems farfetched when most of us can’t even name the MLS All Stars from last season, and if we will ever get a Major League level team here. The recent MLS city selection process proved just that anyway. On the other side, I get our beloved Bats deep roots that take us back to the Louisville Colonels at Parkway Field. But we knew we were only a minor league town and properly embraced it. As an avid baseball fan, I still see baseball on a slow death across the country and it needs to be structurally overhauled to keep future generations engaged in it, or it will look like Catholicism in Europe in a few more decades. But regarding basketball, it’s a different story – we love it, we understand it, we breathe it, and we embrace it in any way we can get access to it. First I am a diehard University of Louisville fan and consider my UofL ticket package as my “stay vacation” because I have loved our Cardinals irrationally since birth, like many of us. I can go back to my grade school days praying my Catholic prayers on my knees at the side of my bed where I would slide in a few Cardinal prayers, asking God if he would help us get our first NCAA title just to “shut up” my Big Blue classmates for once. As a supporter, I think I understand the resources required to support our Two Crown Jewels of NCAA college basketball that are only 70 miles apart…and how blessed we are to have that “world class college” experience any time we want it or need it! Both programs are revered around the country and I feel great pride traveling in my day job and talking them both up every chance I get! I often say Kentucky Wildcat Alumni could field the first two expansion teams by themselves with nearly 30 former Wildcats tearing up the NBA with Kentucky roots. That would be another world record again for us that we should claim! On the flip side, many Commonwealth basketball enthusiasts are too busy cheering on their own respective teams, that they don’t realize our small state has held every major basketball title! The dynasty runs deep! In 2011 alone Bellarmine University won their first NCAA Division II title, the University of Pikeville Division III, not to mention UofK’s NCAA championship victory, and our Lexington-based Georgetown University winning the National Independent Association basketball title—all in the same year, along with the Universities of Louisville and Kentucky both with their steady top 10 annual presence—the state is already a basketball mecca—just needing to be claimed! What other state in the U.S. could ever hold possible the honors of the “U.S. Title State for All Basketball” and “Most NBA Players from One State”? We have many negative people saying no one would buy NBA tickets. Are you kidding me? We sell any real sporting event like no other place in America verified by the Breeders Cup and any PGA event including the Ryder Cup, despite being hard to get to by travel standards. Personally, I have attended NBA games in over half the cities in the U.S., preferring basketball over food on my travel per diem since the early 90’s. In many markets, an NBA game is just another social outing option for many, or a corporate thank you gift to a vendor or management team, or your family ticket package divided with your church group, but here in Kentucky, “Basketball” is a TRUE RELIGION and SHOULD BE! Perhaps it is silly but I actually believe that the NBA needs their Green Bay type city where the franchise has a kind of religious experience with everything they play and NBA watchers worldwide could see “true fanatics” that this game creates. We already have that in our DNA, from our intergenerational connected heritage, our elder’s storytelling passing the torch over family dinners, and in our daily lives where it is embedded in every day conversation because we ALL know BASKETBALL like no other city, state or country in the world! To keep it simple, I don’t really understand the heated political debate about it, the complicated venue debate either, or the economic argument around something so fundamentally simple that we should claim ourselves as “The Basketball Capital and Basketball Mecca” for the world to find! Especially with our horse heritage in the Kentucky Derby, our expanding art community, new business “landings,” the bourbon explosion—our city is on the verge of breaking out into a top city in the nation and a destination spot to live in! Let’s be not only the greatest “two minutes in sports” but the greatest 48 minutes in basketball in the world! We all need to just start celebrating great basketball all around us and move beyond our own bitter basketball rivalries. Go see a Bellarmine University game and tell me their energy isn’t better than anywhere in the country for D1 or D2. Even if you don’t like UofK or UofL, go to a home game at the other venue and observe the passion, or watch our crazy parents in youth basketball games and realize we love basketball for the essence of what it symbolizes to all of us! This sport is a cultural experience that displays lyrical team chemistry when played correctly and is a game that can be played with cost effective economics without barriers to entry. It can be mastered by any size person, we learn life lessons about winning and losing, but more importantly to play by the rules and leave everything you have on the court! 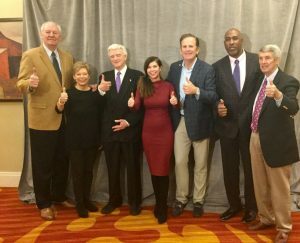 We need to take back “our” basketball legacy, especially its capacity as one of the biggest future economic-drivers and brand it out: “NBA to Louisville,” “The Basketball Capital of the World,” “The Basketball Title State,” and “The Pro-Basketball Training Center.” All we ask is that they return our World Champion Kentucky Colonels back to us so one day we could be the first place in the world to hold all the important basketball titles in one state! And everyone can be a fan! Please embrace the possibility of it, dreaming of something bigger than ourselves, imaging the greatest athletes in the world entering the Basketball Capital of the World. Let’s get serious about it because no matter what rumors you’ve heard, if “we build it they will come,” it is our own “field of dreams” because the NBA knows they have a brand on fire that must grow and breed success – and, as we know, there is no place like Kentucky in the world!